You know exactly where you're going. You're not alone . . .
With over 2 million copies of her books sold worldwide, number one bestseller Clare Mackintosh is the multi-award-winning author of I Let You Go, which was a Sunday Times bestseller and the fastest-selling title by a new crime writer in 2015. It also won the Theakston Old Peculier Crime Novel of the Year in 2016. 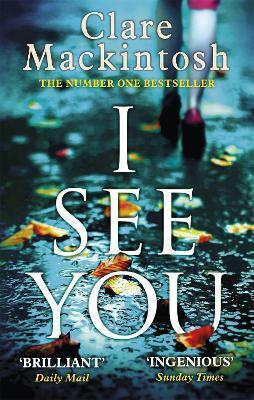 Both Clare's second and third novels, I See You and Let Me Lie, were number one Sunday Times bestsellers. All three of her books were selected for the Richard & Judy Book Club, and together have been translated into over thirty-five languages. Clare is patron of the Silver Star Society, a charity based at the John Radcliffe hospital in Oxford, which supports parents experiencing high-risk or difficult pregnancies. She lives in North Wales with her husband and their three children.